The Patriots learned a valuable lesson in respecting Mitchell Trubisky today. With the Bears down by seven with two seconds left, the “tittiess” kisser threw a Hail Mary pass from the team’s own 45-yard line, and it was actually caught. 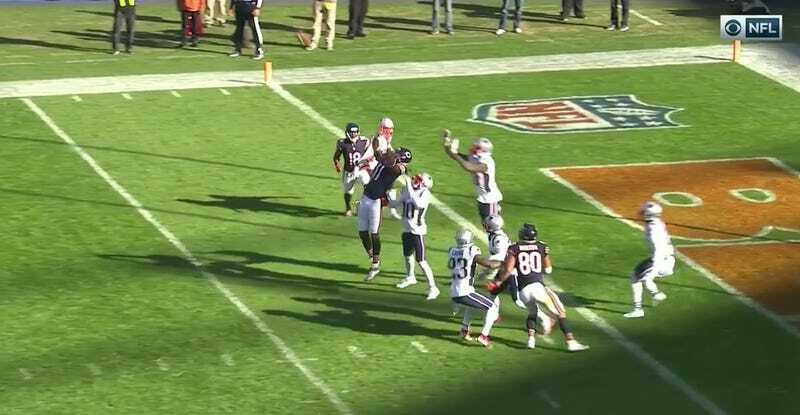 Receiver Kevin White just needed to push through the final two yards to complete the miracle play, but he couldn’t. New England’s secondary reacted to the screwup quickly and forced him into a gang tackle. That’s a tough one for White, a player whose career has been mostly characterized by his ability to get injured. He could’ve been known for something much better. Chicagoans would’ve called that touchdown the Hail Mitchell or Bear Mary, as they’re quite creative like that. The Patriots escaped with the 38-31 win.